Carrie Vitt with Deliciously Organic once told me that she spent four years putting together her cookbook, and I believe it. Her book is so beautifully done that it honestly puts a lot of other cookbooks to shame! Plus it has such a wonderful personal touch and page after page it’s just obvious she’s poured her heart and soul into this publication. 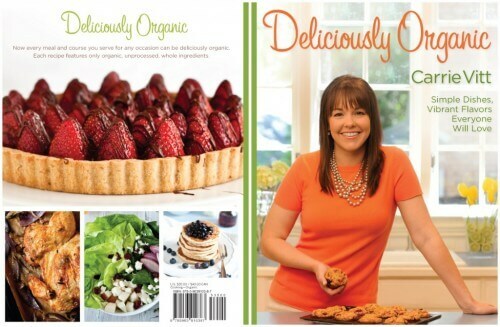 A lot of people ask if there is a “whole foods” cookbook I can recommend and here is your answer…Deliciously Organic! The pictures: Oh my gosh the pictures! Carrie takes amazing pictures herself (just check out her blog), but she hired a professional food stylist and photographer for her book and it shows. The resources: This is a great book for “real food” beginners because it is full of helpful resources on everything from understanding oils to reading food labels to making homemade mayo to navigating recommended websites. The personal touch: Carrie shares her own personal story, which includes her struggle with debilitating migraines that she eventually got under control with nothing other than organic food. Plus don’t miss the pictures of her adorable family right before the dessert section. Today, I want to share a dessert recipe from Carrie’s book that is the perfect replacement for all those highly processed boxed chocolate pudding mixes. We made a batch of this chocolate mousse over the weekend and let me tell you what; my girls could not get enough! The flavor is just divine, but don’t take my word for it, you must try it yourself…. Combine butter, 1/2 cup plus 1 tablespoon maple syrup, cacao powder, vanilla, pinch of salt, coffee, and 3 tablespoons water in a medium heat-proof bowl. Set bowl over saucepan filled with 1 inch of simmering water. Whisk frequently until smooth and remove from heat. Whisk egg yolks, 1 1/2 teaspoons maple syrup, and 1/8 teaspoon salt in a medium bowl, for about 30 seconds, until it lightens in color. Add chocolate sauce and whisk until combined. Let cool until just above room temperature. In a bowl of a standing mixer or with an electric mixer, whisk egg whites on low until frothy. Add remaining 1 1/2 teaspoons maple syrup. Increase the speed to medium high and whisk until soft peaks form. Stir about 1/4 of the egg whites into the chocolate liquid, and then fold in the remaining whites by scooping the egg whites into the mixture gently, cutting down the bowl, across and up the other side, Rotate the bowl a quarter turn and keep folding until liquid and egg whites are combined. Whip heavy cream until soft peaks form. Gently fold all of the whipped cream into the chocolate liquid until no white streaks remain, using the folding technique above. 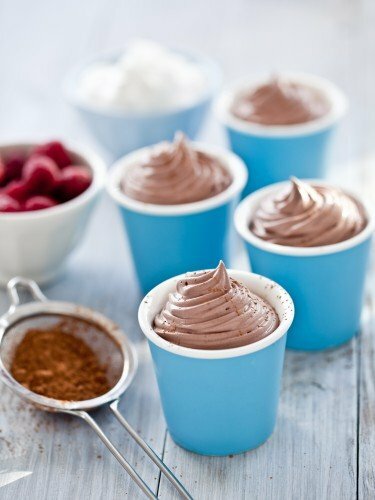 Ladle mousse into individual bowls. Cover and refrigerate until set and firm, about 2 hours. Used with permission from International Focus Press © 2011. The coffee is used to bump up the flavor of the chocolate. You won’t taste it in the end product. You could use herbal coffee (such as teeccino) or decaf as a substitute. I just bought this cookbook a couple weeks ago and I have to say it is now my “Go To” cookbook! 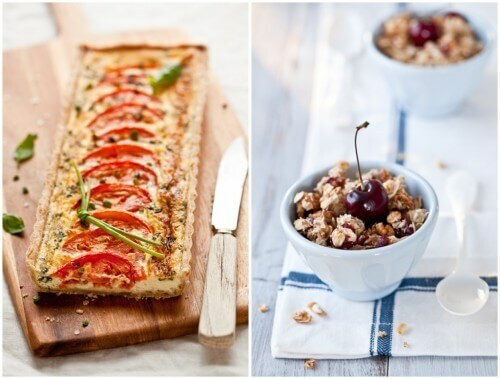 There are so many delicious recipes and they all seem fairly easy for the “at home” cook. I especially loved reading her story at the beginning and the explanation of the basic ingredients and why it is best to use fresh and organic. Also, the basic recipes in the back are invaluable – the homemade mayo, how to make really good brown rice, etc. I can’t wait to try them all! 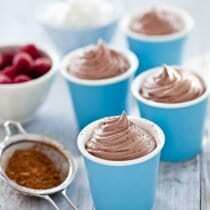 I haven’t tried this chocolate mousse recipe yet, but it’s on my list! My 7-year old daughter went through the book and put bookmarks in all the recipes she wants us to try. As you said, the pictures are just gorgeous! I wonder if this would be okay with Carob powder instead of cacao? I have a whole canister of carob powder I need to start using. I bought it to make “chocolate pudding” along with avocados and honey. Even with a coupon, this book is $25. It is much cheaper elsewhere on the Internet if you just look around. It’s $23 on Amazon. Yes, but the author makes more when sold directly. Amazon takes a VERY large chunk of profits. My husband is a musician and when selling on Amazon we make approximately $.75 profit/CD because of the low rate they pay and the shipping costs associated with how they place orders. When he sells direct we make approximately $10/CD or $9.25 more for the exact same product even though they do not charge $9 less…they just pay such a low rate that they end up with the profit, not our family. I’m all about saving money, but sometimes it is nice to know you are supporting the creator of a project more than the big business. Just thought you might want to know why their prices are so low! I never knew that! I’m so glad you bought this to our attention. Even better knowing I bought the book directly from Carrie. I have owned a fair share of magazine subscriptions & cookbooks, this books is outstanding! Wonderful pictures and really something for everyone. Do you know if there’s a way to make it dairy-free? Does soy or lactose-free milk work as well as the heavy cream? Amanda – You can use herbal coffee such as Teeccino (www.teeccino.com). It’s a blend of herbs such as chicory and carob. Or a dandelion “coffee” such as Dandyblend would work well (www.dandyblend.com). Joani – Unfortunately there isn’t a way to make this dairy free. Thank you for the recommendations! I will look right into those. Thank you for allowing Lisa to share this recipe! Is there a lot of vegetarian recipes in her book, or is it mostly meat-based recipes? I love buying organic/natural cookbooks, but it seems that aside from the breakfast and dessert sections, most of the recipes are centered around meat! I have many vegetarian recipes in the book. Two chapters are devoted to sides and salads and only contain a few recipes with meat. I also have a several main courses that are vegetarian (and a few with fish or shellfish). And the last chapter, “Basics” has recipes like pie crust, chocolate sauce, whole wheat pasta – and none of those recipes contain meat. Hope that helps! Beth, I love your block O picture! OH, my friend!!! And because of your post, I’m going to make this mousse for my family for our weekly dessert on Sunday!!! This looks really good i’m wondering if it would be a good frosting substitute?? Ok I’m totally confused…not hard to do. What is a heat-proof bowl and if it’s heat-proof why put it over a simmering pan of water? This recipe (and many similar chocolate recipes) call for placing a bowl over a pan of simmering water because the chocolate mixture in the bowl needs to be heated slowly and gently. Heating the chocolate mixture in a pan placed directly on a burner would cause it to scorch and burn. Catherine: “Heat-proof” meaning it can take heat and not be damaged. So a glass pyrex bowl would be a good choice over a plastic bowl. The glass bowl is heat-proof, the plastic bowl is not. Can you simply use a metal double boiler? Deliciously Organic- Thank you so much after switching to this way of eating I have felt so much better and have waay more energy, and didn’t want to stop just because it is my birthday, so I am very excited to try this. I’m wondering if you have different views on sugar than Lisa does. I noticed in your chocolate buttercreme cake (that looks wonderful) you used both organic whole cane sugar and muscovado sugar. Do your views differ or do you just very occasionally use those sugars as an exception and treat? Is there a substitute other than decaf or herbal coffee? I’m actually allergic to coffee (a serious bummer!!! )… but as the coffee is meant to boost the flavor, I’m just wondering if there is another ingredient that I could use that would do the same. Thanks so much! Is this recipe correct? Noticed that it calls for maple syrup twice?? We tried this recipe yesterday and followed it to a tee. All we ended up with was an ultrasweet soupy mess. We also didn’t care for the flavor of the maple syrup in this concoction. It’s killing me to throw out all these expensive ingredients. Virginia – Yes, a metal double boiler would work well. Ashley – I’m fine with using organic whole cane sugar/sucanat (not to be confused with evaporated cane juice) http://www.amazon.com/Wholesome-Sweeteners-Organic-Sucanat-16-Ounce/dp/B000EA3M92/ref=sr_1_1?ie=UTF8&qid=1318348883&sr=8-1 because it’s simply cane juice that has been dehydrated. I also use muscovado – an unrefined dark brown sugar, maple sugar (dehydrated maple syrup), or coconut sugar. These sugars are unrefined so I feel good about using them in moderation. I don’t like to solely use honey and maple syrup in my baking because most times the end product isn’t exactly what I’m looking for. So on those occasions I reach for one of my favorite unrefined sugars. Cheryl – Are you also allergic to herbal coffee? It doesn’t have coffee in it, but uses a blend of herbs that taste just like coffee. If so, unfortunately I don’t have another substitute. Tammy – Yes, maple syrup is in the recipe twice. The different measurements are used at different stages in the recipe. Kim M. – I’m surprised to hear about your mishap. The recipe comes directly from my book and was tested by a professional test kitchen. I’ve never had any negative feedback on this recipe so I’m not sure what happened. As long as no substitutions were made, the problem might lie within the whipping and folding – it can take a bit of practice. Since you have “chocolate soup” you could eat it as soup, mix it with berries, or pour over pound cake. What is that long, rectangular thing pictured above the mousse with the tomatoes? It looks like a quiche – and it looks delicious! Omigosh, omigosh, omigosh…just made this and it is sooooo good!! I even tried to screw it up by accidentally using 1 cup of the cocoa and syrup each instead of the 1/2 cup and it still came out perfect! We just have about 10 servings instead of 6! =)In fact, it’s so good I’m now scared to make it the “right” way! This recipe looks delicious. Is there a way to make it without using raw eggs? I’m just nervous about serving dishes with raw eggs to my kids. As an option you can buy pasteurized eggs at the grocery store, in fact, many of the eggs sold on store shelves are pasteurized. The most important thing is to make sure they come from a good source and that the shells are clean before breaking them. I just wanted to say hello from a fellow Air Force wife. Also, I just made my list so I can whip this up tomorrow as a special treat for my family. Hi, this recipe looks super delicious. I think I need to get a double boiler though. I tried to make custard last year for Christmas without one, and my arm got tired so my top pan rested in the bottom too tightly, and the pressure built up and blew up all over me and my kitchen. I am nervous to try these types of recipes without a double boiler now. Anyways. I am curious about the herbal coffee. My husband has strong reactions to the caffeine in coffee, even decaf. He can drink herbal teas, but not caffeinated ones. I will have to look into the herbal coffee that’s not really coffee. I’ve made this recipe twice. It is absolutely wonderful! Perfect chocolate fix. However, this may be a really stupid question but do you think you can sub half and half for the heavy cream to cut calories?? I love making this recipe! I currently have a lot of heavy cream and I was wondering if I whipped it and froze it for future thawing and use, would that be ok to use in this recipe. I have never tried freezing whipped cream, but hate to see it go to waste! I don’t like the taste of maple syrup–would this recipe work with honey? I did not have any maple syrup and made this recipe with honey. It worked great! Delicious. This looks great…but very fattening!! I am starting the 10 day challenge and am a little worried about all the butter used in the recipes?? Hey, I was just wondering how much of a difference it would make if I were to leave out the coffee? I don’t make it too often (and when I do, it’s decaf), and I don’t really feel like making coffee just for a couple of tablespoons of it, lol. Could I leave it out? Thank you! Okay, great! Thanks so much! I’m on the same page as lavedaercat99. I don’t drink coffee, nor do I have a coffee maker. I wonder if instant coffee would work. I was disappointed with this. The consistency was nice but it wasn’t the flavor I liked. It was WAY to bitter. I’m thinking that it was the unsweetend cocoa and the coffee mixture… What would you recommend? Using sweetned cocoa? Hi. I want to make a chocolate pie and have a recipe that calls for choclate pudding mix. I do not want to use the highly processed one. Would this recipe make enough to go straight into a 9inch graham cracker crust pie shell? This looks wonderful! I’m looking for a good dessert for Easter brunch. Is the nutrition information available? Specifically the sugar grams per serving? Thanks. Hi Ann. We do not provide nutrition info on our recipes. This post helps explain why: https://www.100daysofrealfood.com/2013/01/04/healthy-eating-defined/. When a person has Type 1 Diabetes they MUST know the carb count in the food they eat. Having a child with Type 1 means I’ve been counting carbs for a long time, because there is a constantly changing ratio of required insulin to carbs. Your recipes are a privilege and I enjoy them. I can figure out, with lots of basic math, how many carbs per serving. Perhaps you haven’t studied about Type 1, but if you do, hopefully you’ll understand how this is different than a fad diet and reconsider? The pure foods are so much better, but when there are ANY carbs in the food, it becomes dangerous and potentially life-threatening to NOT have an accurate carb count. But this is how Diabetics live…and we just keep doing math, and trying to educate along the way. Thank you for your time! Hi Sharon. Lisa’s focus has been on getting people off of processed foods and eating real foods without getting caught up in the numbers. We do understand the importance of details for you. I am uncertain as to whether those details will be added in the future but Lisa is certainly sensitive to it. Sharon, I’m in a similar boat. I use My Fitness Pal to load the recipes and track my carbs. Maybe you can use it, or a similar tool to save you a little math. Can these be made a day ahead? Just wondering if they will deflate a little because of the egg whites…Anyone tried it a day ahead? Hi Erin. I think it should be fine. Hi, can this be made grating/chopping a block of organic dark chocolate instead of coco powder? If so how man ounces of chocolate should I use? Many thanks. Hi. We’ve not tried this with solid chocolate. Has anyone subbed honey for the sweetener in this? Did it work. WA she honey overpowering? Have extra honey on hand but maple syrup is so expensive. This might be the best dessert ever. So good! PS: I also left out the coffee as my kids can always pick up the flavor. Tastes great w/o it.